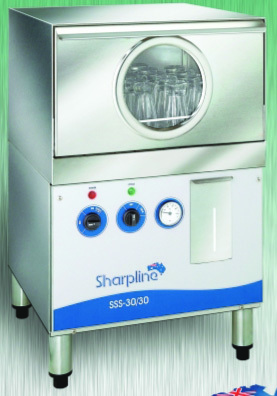 The Sharpline SSS-30/30 Commercial Glass Washer is a fully automatic machine with the ability to wash 30 x 200mL glasses every 30 seconds. Wash Cycle: hot wash with a hot rinse. An additional cold rinse can be selected after the hot rinse at the flick of a switch. A large door opening enables the machine to wash tall glasses. Hot water that is internally boosted by a 3300-watt element and thermostatically controlled to 82oC. Fully automatic detergent dispenser integrated in wash cycle. Basket size is 445mm x 365mm and will hold 30 x 200mL glasses or 24 x 285mL glasses. The SSS-30/30 is suitable for under counter or freestanding installation. High performance pump ensures constant water pressure. Electrical requirement: Provide 15-amp single-phase outlet (3.5 kW).